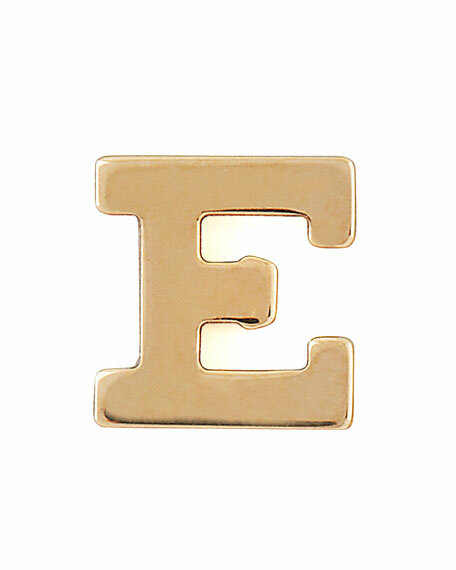 Spell out your initials, those of a loved one, or give this glittering Zoe Chicco letter earring as a gift. Please note: Single earring only; right and left earring sold separately; order two to complete your pair. Kismet by Milka single feather hoop earring. Polished 14-karat rose gold hoop and drop. Solitaire diamond and feather dangle. 0.04 total diamond carat weight. Lever backs for pierced ears. Approx. 1.2"L drop. Sold individually. Imported. Please note: Single earring only; each sold separately. Seven-diamond single earring from Kismet by Milka. Polished 14-karat rose gold hardware and chains. East-west bar with seven champagne diamonds. Seven-diamond single earring from Kismet by Milka. Polished 14-karat rose gold hardware and chains. East-west bar with seven champagne diamonds. Two interlocking dangle rolo chain drops. 0.04 total diamond carat weight. Post backs for pierced ears. Imported.